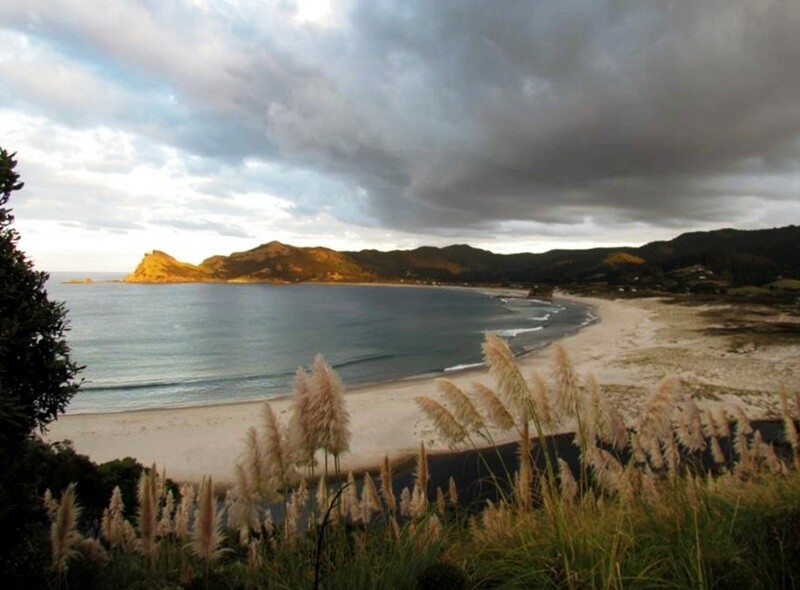 THE largest of Auckland’s Hauraki Gulf Islands is Great Barrier Island, also known as Aotea, the island of the white cloud or the shining sky. 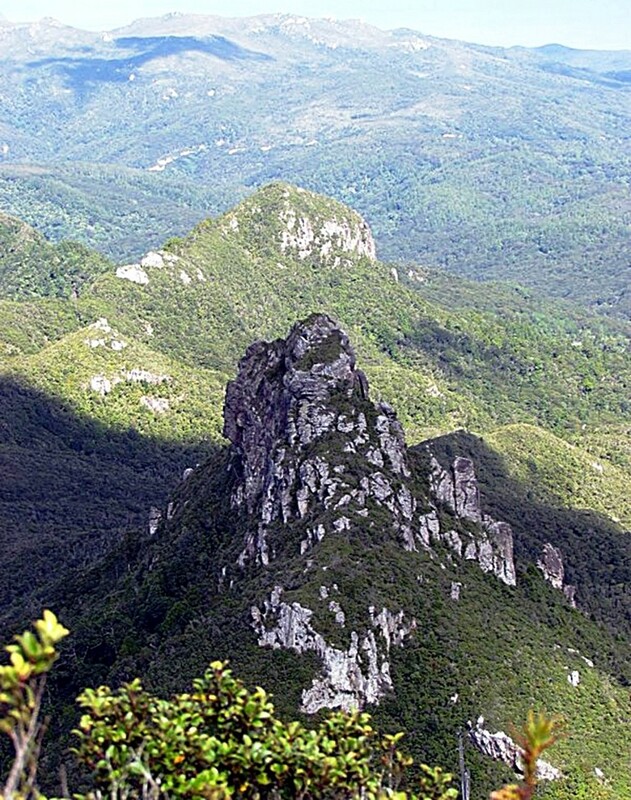 When I get tele-marketing calls selling holidays on Australia’s Great Barrier Reef, I tell them, ‘We have our own Great Barrier Island.’ I don’t tell them it’s not so big! As of the time of posting of this blog, you can see the article here. Located north-east of Auckland on the edge of the Hauraki Gulf Marine Park, New Zealand’s ‘National Park of the Sea’, the island can be reached by a 4-hour ferry ride, or a scenic half-hour flight. Some time back, I bought shares in a bach (cabin) there along with a few other people. 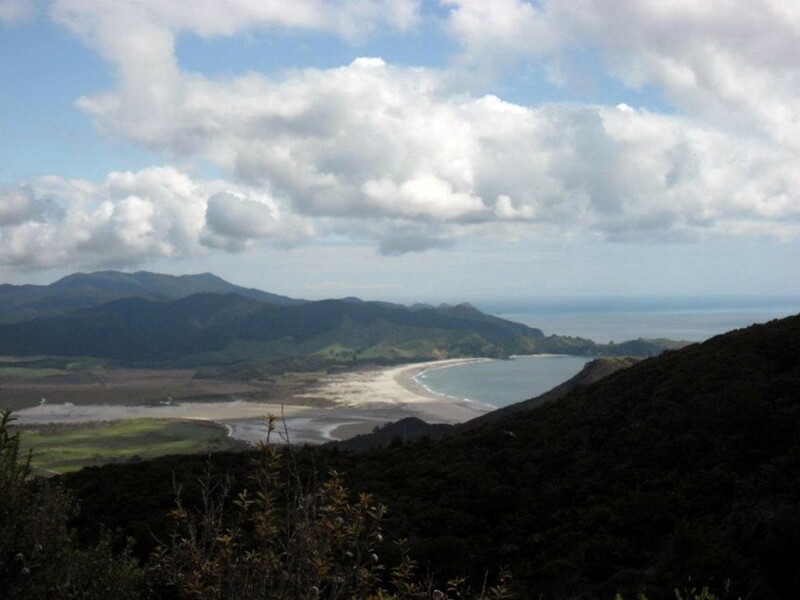 Over the years, I’ve loved going over to the island and tramping the 621-metre high Mount Hobson, also known by its Māori name of Hirakimata, as well as visiting other parts of the island. There are no possums, stoats or ferrets on the island, which means that despite the few remaining rats the forest is largely untouched. 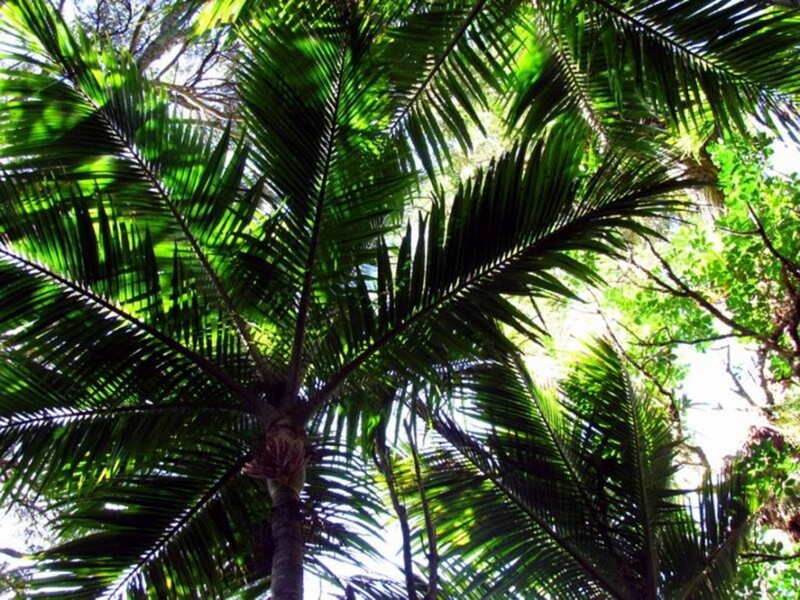 The island is beautiful, with jagged green mountains like those seen on Polynesian islands in the tropics and huge nīkau palms — the only palm endemic to New Zealand (in two species) and the southernmost palm in the world, growing to 44 degrees south. 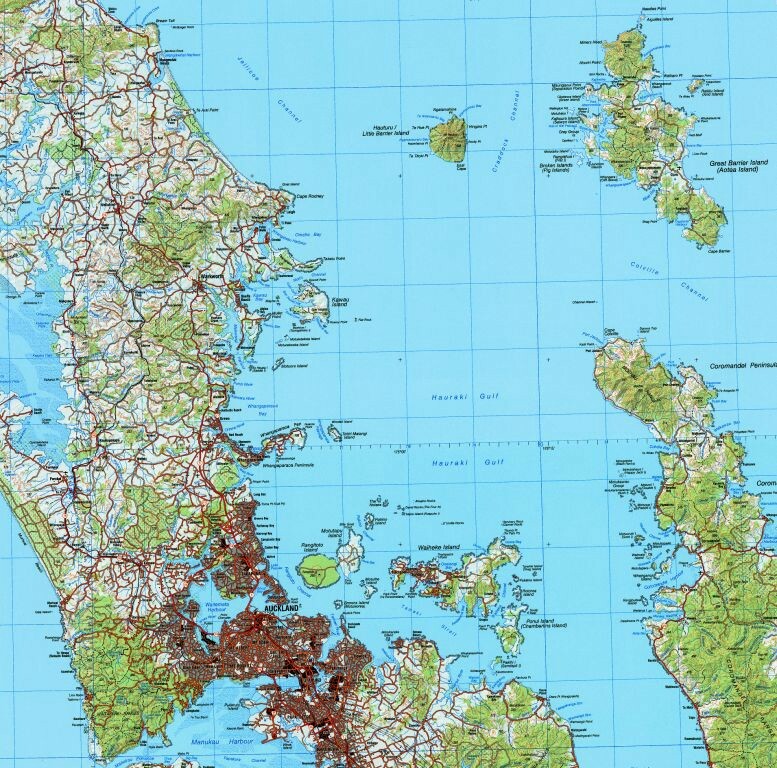 Furthermore, though handy to Auckland, Great Barrier Island / Aotea has no reticulated electricity, so you have to rough it a bit. It doesn’t get a lot of day-trippers either. It used to be that you couldn’t get much cellphone reception either, but now you can in most places. Altogether, it is the perfect place to get away for a proper break. 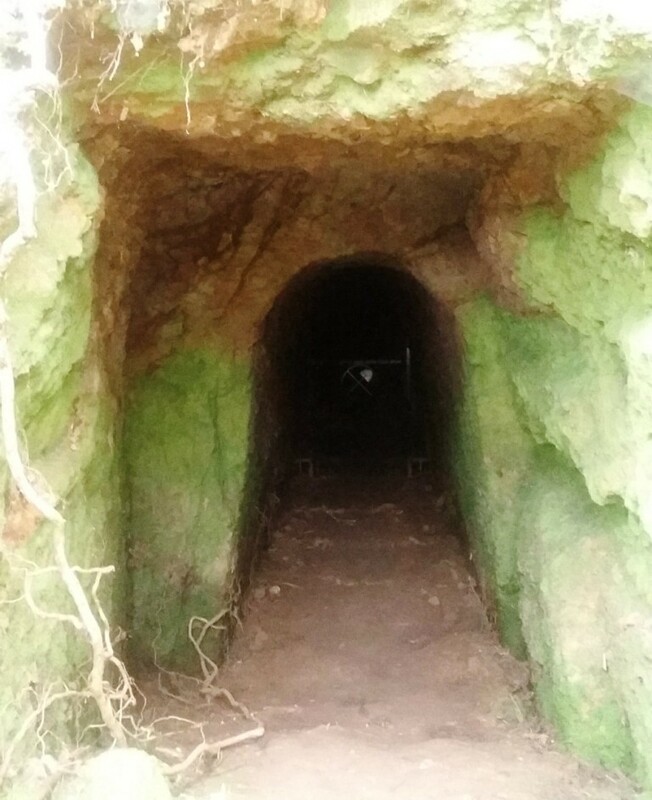 Known as the Barrier for short, the island has a history of mining and is riddled with disused mineshafts. 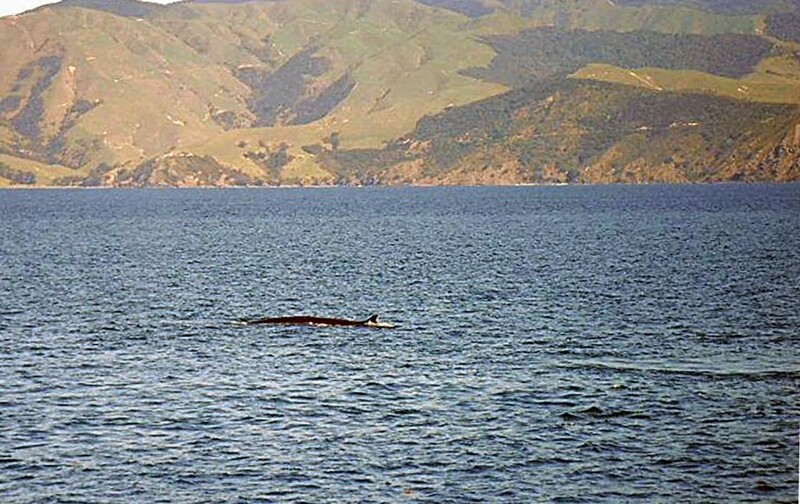 This is something it has in common with the nearby, equally rugged, Coromandel Peninsula. 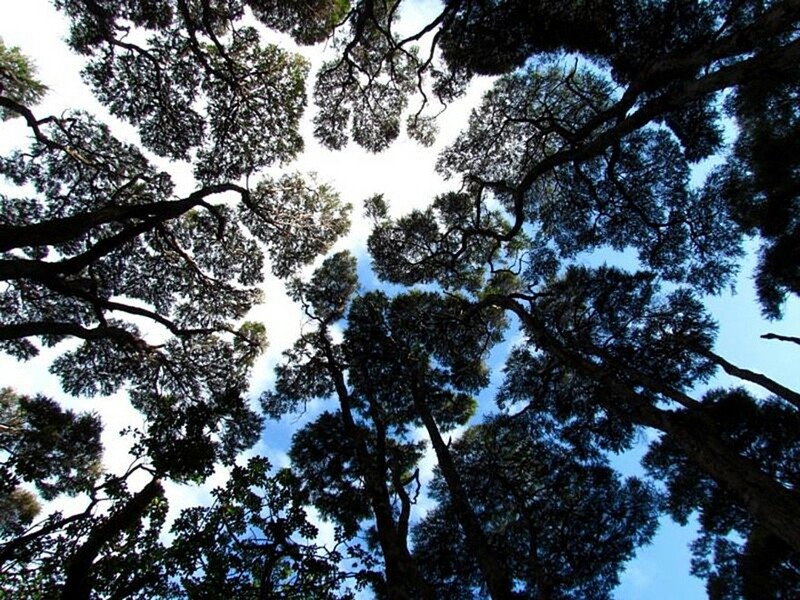 To a large extent, New Zealand conservation revolves around the control of introduced pests. For instance, an estimated 70 million individuals of the introduced Australian brushtail possum species, trichosurus vulpecula — ‘the little foxy one with the brush-tail’, which makes it sound extra cute — are thought to consume 21 thousand tonnes of New Zealand bush a night (brushtail possums are nocturnal). 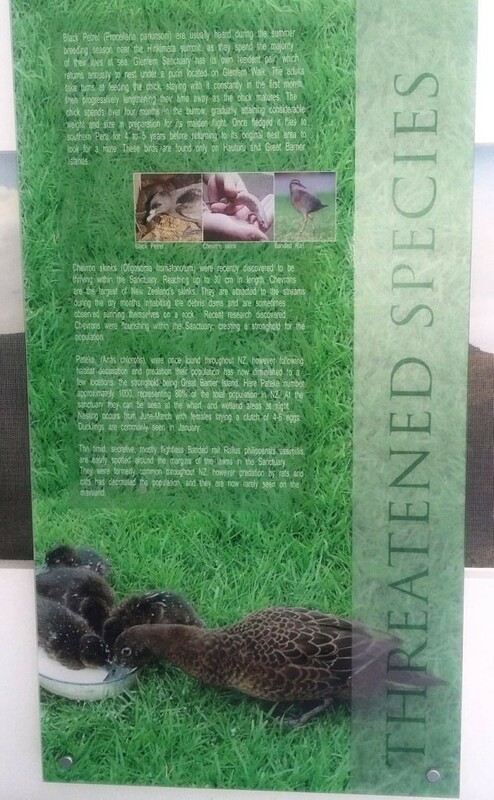 For the story behind these facts and figures, see the New Zealand Department of Conservation flier A Pest of Plague Proportions. In New Zealand, the brushtail possum eats all forms of vegetation and also eats eggs and young birds; as do rats, ferrets and stoats. On top of that. brushtail possums spread diseases such as bovine tuberculosis, putting the farmer at risk. So, the introduced species of possum has few friends in New Zealand. 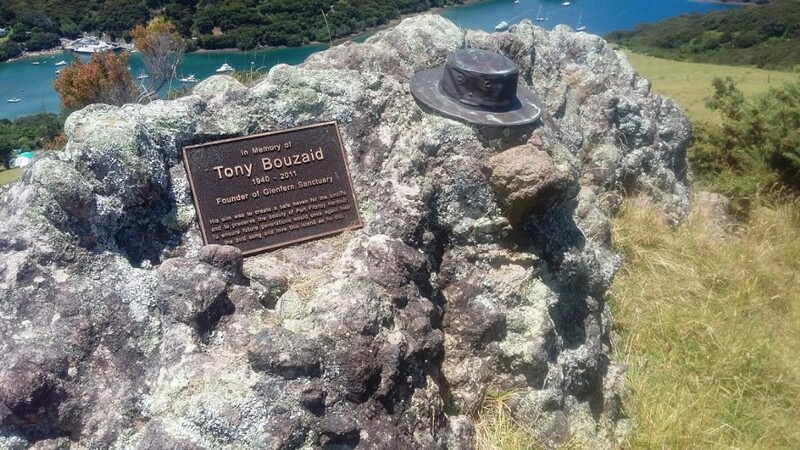 Because Great Barrier Island is so isolated, brushtail possums never made it ashore and this makes Great Barrier something of a special place. On the other hand, rodents are there, as they are almost everywhere in New Zealand. 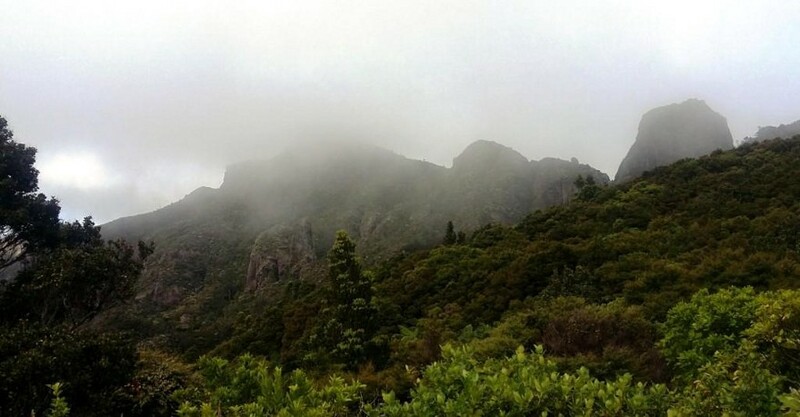 At the moment there are plans to exterminate all the rodent pests on nearby Rakitu or Arid Island using brodifacoum, so that the island can be re-populated by native species, which of course evolved in the absence of ground-dwelling mammals. There is some opposition to this, and there’s a story on the controversy here. Rakitu or Arid Island, as seen from Harataonga Beach. The weather was less unseasonal when I took this picture than it is in the featured image (taken at Awana Beach) with which this blog begins. 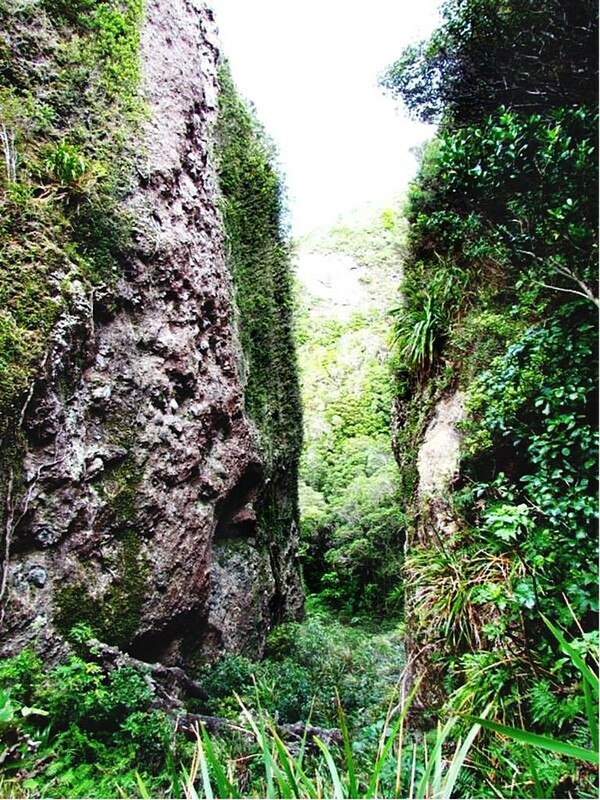 Several of the most popular destinations on the island are on a scenic trail known as the Aotea Track. 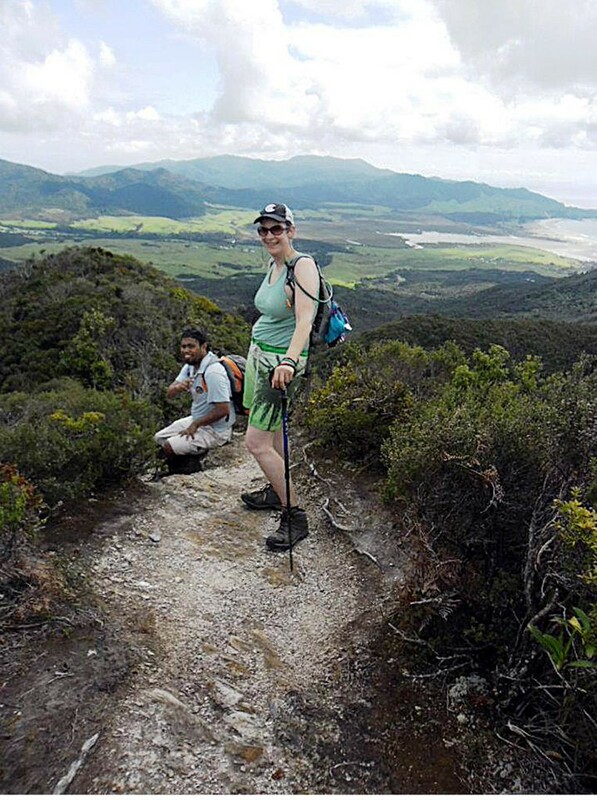 These include the peak of Hirakimata, and Windy Canyon, a Lord of the Rings filming site, I walked a part of the Aotea Track in January 2015 with my friend Rose and her partner, Daniel. We hiked along it to the top of Hirakimata, where there are amazing 360-degree views of the island. 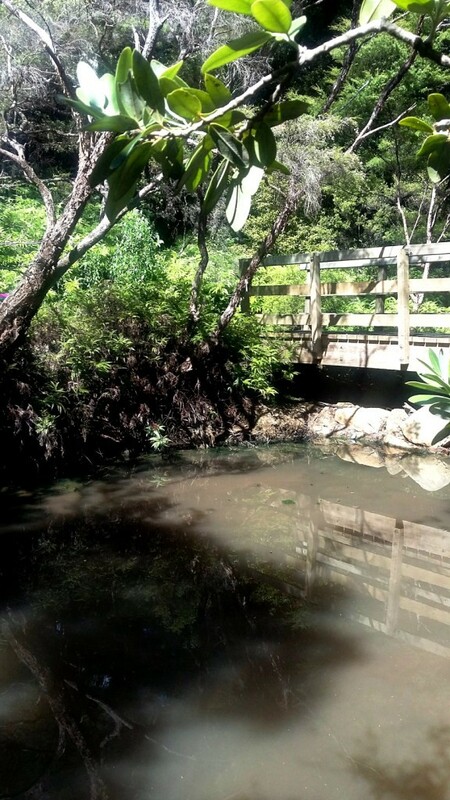 There are also free hot pools located on a section of the track that leads from the Whangaparapara Road to Hirakimata: the Kaitoke hot pools. Once upon a time Rose and I also tramped the tramline track in the middle of the island — a track that used to be a bush tramway, for hauling logs — and found a well-formed bath with hot water flowing into it that had been carved into the rock by a Victorian gentleman, at a place called the Peach Tree hot springs. 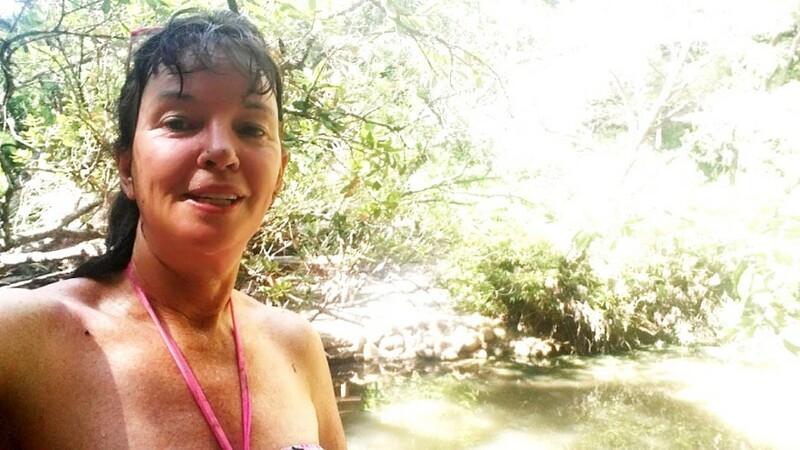 The bath is at a hidden location, now somewhat overgrown and quite hard to find, just above the better-known and more accessible Kaitoke hot pools. I later re-did that walk by myself and visited Mt Heale Hut, which is a back-country hut with all kitchen implements, pots, pans, and even a dish brush supplied, and a view to die for. I read in a December 2014 New Yorker article I found at that Mt Heale (‘ The big kill: New Zealand’s crusade to rid itself of mammals ‘) that New Zealand conservation was indeed to a very large extent a matter of calling in the exterminators. The New Yorker article gives a rather negative impression of the humanity of this approach. However, a more recent (paywalled) article in the New Zealand Listener by Rebecca Macfie, ‘ Natural born killers ’, 26 November 2016, makes clear that many of the introduced predators in New Zealand experience boom and bust cycles; if they are not poisoned, they will starve, after first eating as much of the native bush and wildlife as possible. Certainly, our methods are working to the extent that the funding and resources (often volunteer resources) are available. 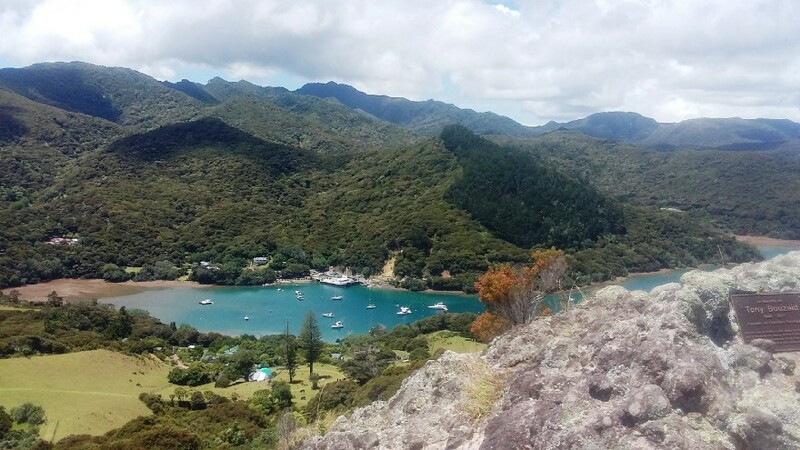 Great Barrier Island had been partly cleared of its trees by pests such as possums, and is only now regenerating after all the work the volunteers have done in wiping out the pests. In the long run the scientists would prefer a species-specific contraceptive, but so far that has not yet been developed. Another article by Rebecca Macfie in the 3 December 2016 issue of the New Zealand Listener, Saving our species ‘, not paywalled at the moment, follows up on such long-term solutions. 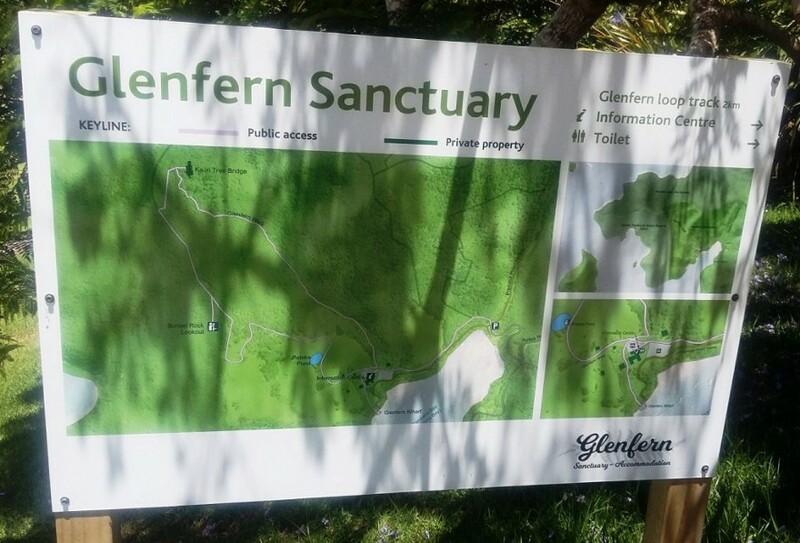 Alongside government conservation efforts, at Port Fitzroy, on the western shore of the island, there is also a private conservation sanctuary called Glenfern, founded by the late Auckland yachtsman Tony Bouzaid. 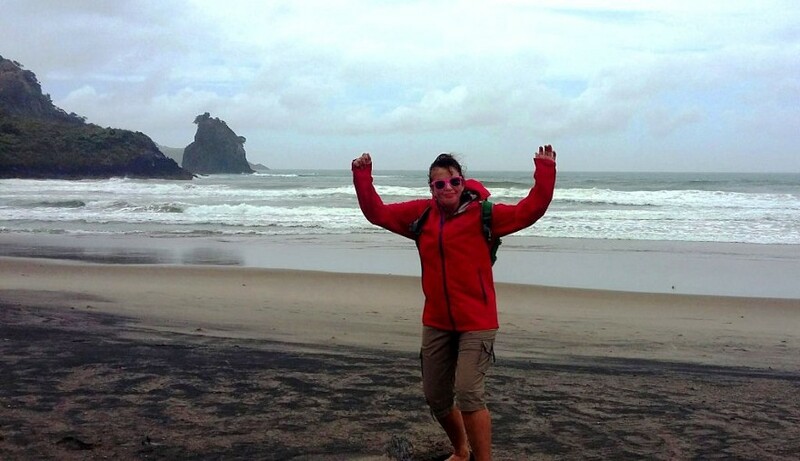 When I was at Port Fitzroy in 2015, I hiked up to the local entrance of the Aotea Track. It turned out that I couldn’t tramp any further because of storm damage that had washed the track away! 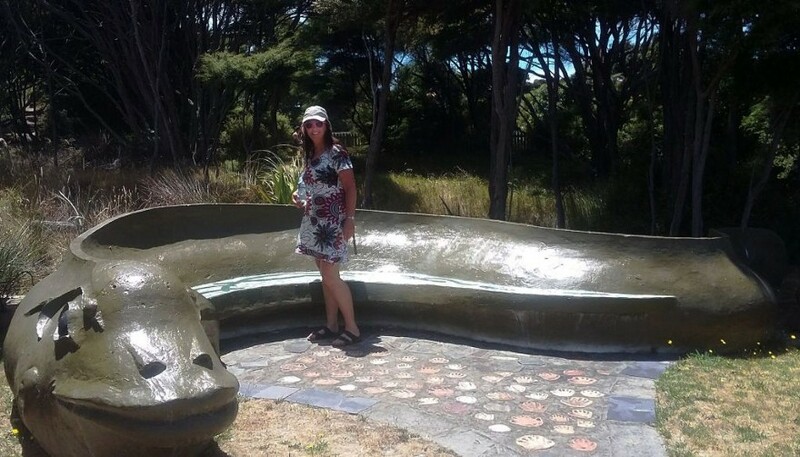 It was very sad, as they had upgraded all the tracks on Great Barrier Island in 2014 ready for tourism, and on the day the minister arrived to open them, a great storm came through the area and destroyed a lot of the hard work that had been done. However, the track and the huts re-opened in 2016 so now they are bouncing back. 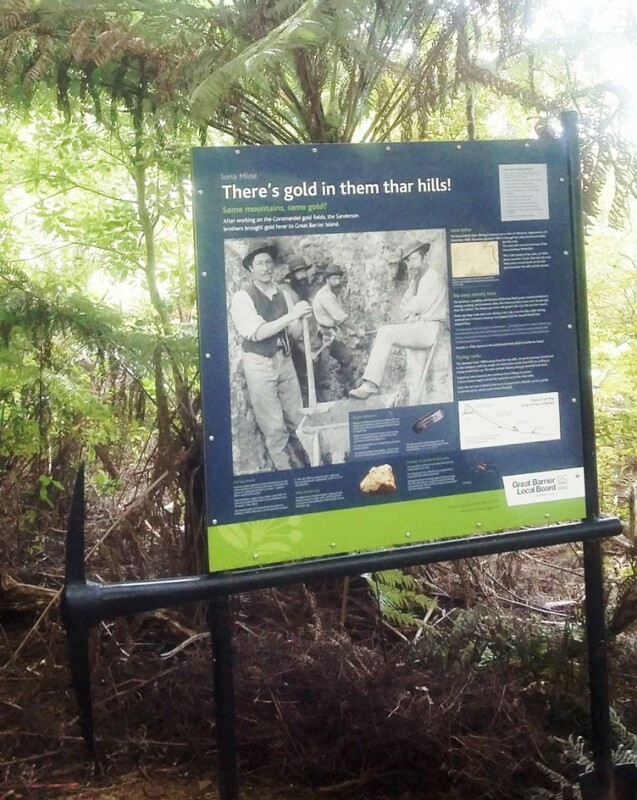 In 2015, the New Zealand Government created the Aotea Conservation Park on the island. 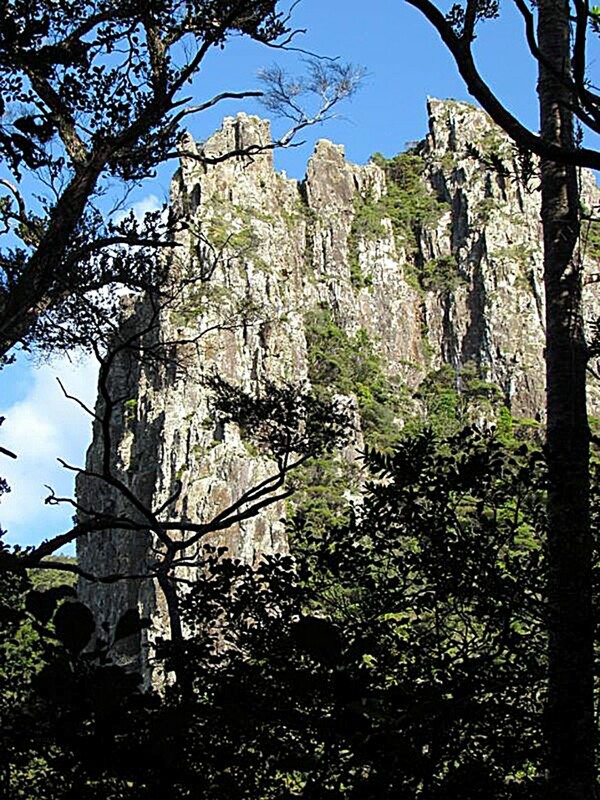 The Park’s advisory body, the Aotea Conservation Park Advisory Committee (ACPAC), is now lobbying for the Aotea Track to be proclaimed a Great Walk, which would give it the same status as the Milford Track and the Routeburn Track. Lastly, let’s no forget the marine life! I spent New Year 2017 / 2018 on the Barrier, and I’m pleased to say it’s better than ever. Some of the photos in this blog are from my latest trip. I even swam with dolphins at Okupu (Blind Bay)! It was also great to see new community artwork. I went to a fair at Claris, the little township next to the island’s airport, which was being organised to raise money for the Aotea Family Support Group Charitable Trust. At Claris, a world champion breaks singer from New Zealand was performing. I missed out on the Great FitzRoy Mussel Fest and FitzRoy Family Festival, held at Port Fitzroy, however. Here are some videos I shot, of a storm at Awana Beach (where the feature image that leads this blog was taken), and the breaks singer at Claris. To round off, Aucklanders have long marvelled at the Barrier’s starry skies, criss-crossed with clearly visible wandering satellites and streaked by meteors. A small population, lack of mains electricity, and hardly any streetlights, all help to keep the skies desert-dark even though the island isn’t really all that remote. 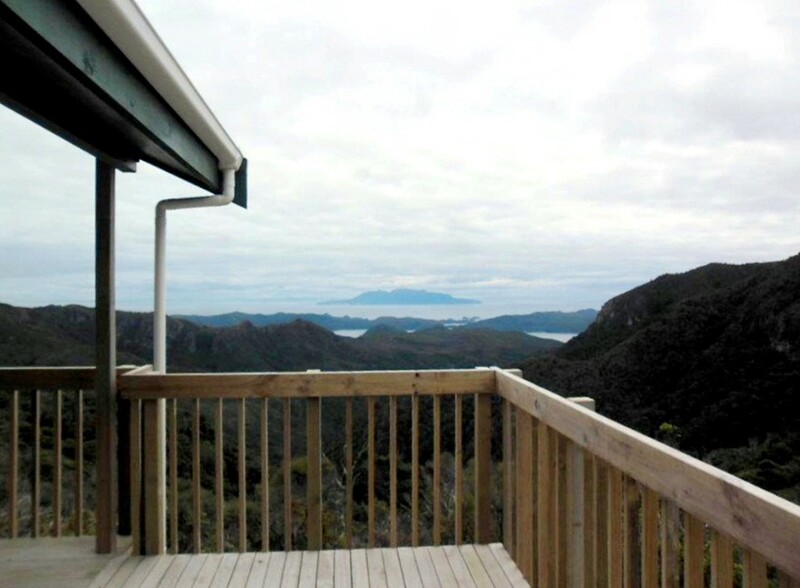 In 2017, Great Barrier Island was awarded Dark Sky Sanctuary status by the International Dark Sky Association (ISDA), which will encourage astronomically-minded visitors. There are twelve IDA Dark Sky Reserves including one at Lake Tekapo in New Zealand, but only three Dark Sky Sanctuaries, astronomical viewing sites which are even more pristine. The three Dark Sky Sanctuaries are at Cosmic Campground in New Mexico, at the Elqui Valley in northern Chile, and now at Great Barrier Island as well. The summer is normally the time to go to Great Barrier, because pohutukawa trees are everywhere and they blossom at Christmas. It’s also the summer holidays, of course. The locals hope that Dark Sky Sanctuary status will increase winter tourism as well, since in winter the nights are longer. 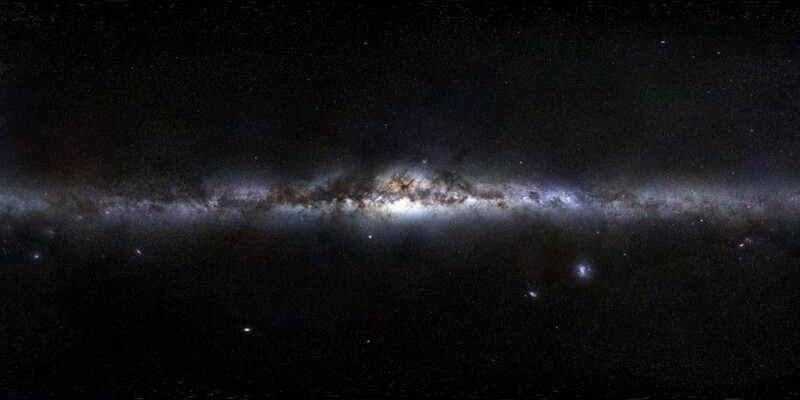 At that time of year, it’s also possible to see the core of the Milky Way, which lies in the constellations of Scorpio and Sagittarius; whereby the Milky Way comes to look like a poached egg seen side-on rather than just a band of stars. These constellations are most visible at mid-year and are more easily seen from the southern hemisphere than the northern because the nights at that time of year are longer in the south, it being winter downunder. The view from Great Barrier should rank with the clearest in the world, and of course one advantage of Great Barrier as a Dark Sky Sanctuary is that it is, as National Geographic says, only 55 miles (90 km) from the big city of Auckland.